Another writer in our series of student reviews, Christine Buckley has been at the University of Kent for four years where she studies History and Philosophy of Art at undergraduate and Masters level. She hopes to continue her studies at PhD level and eventually hold a career in academia. Quiet Still Life (2010) immediately caught my attention because I felt it was different from the other pieces in the exhibition. Hilton’s style in this piece uses muted colours and artistic skills to create a visually outstanding art work. The greyish blue tone of the piece which incorporates hints of white and includes colouring the frame in the same way works very well and creates a piece which is coherent. It is also one of the pieces in the show that really showcase Hilton’s abilities as an artist. What is depicted is quite clear and expertly executed. I feel that a lot of thought went into making this piece an artwork that needs to be looked at deeply to intrigue thoughts within the viewers as it did with me. This is a stand-out piece in the show that is a testament to Hilton’s skills which uses subtlety and precision. 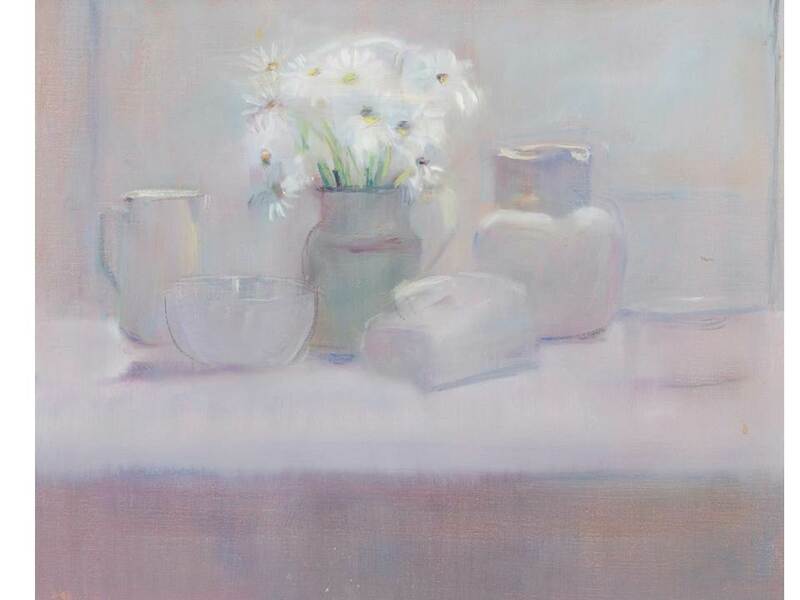 Quiet Still Life has the elegance to steal the show.